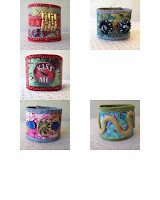 I finished the 8 painted canvas wrist bands I've been playing with. One of them had three large beads side by side. I cut the beads off this one and set it aside. (I'm planning on getting it dirty and sink washing ... I think these would be perfectly suitable for a handwash ... but want to make sure. . The beads layed out at angles when put on the wrist and did not look good. A lesson learned. I took photos this afternoon, and the photos for Wrist Band 12 and 14 did not turn out well. So, I'll retake those over the weekend. These turned out fairly well. I like them. Each lay over the wrist nicely and are sturdy pieces. I'm going to post them on Artfire this weekend and see if anyone has any interest in them.